Let’s face it, friends — we are living in the era of the subscription box. Now, while some of these are just lovely (Tea! In my mailbox! In a purple pouch! Every month! ), I can’t help but notice that the abundance of prefab options has taken some of my own care-package-creation creativity down a notch or two. So while of course there are abundant choices ready-made for you to send a goodie box to a friend, I’m firmly in the camp that the best tea care package is one you make yourself. Below, I’ve gathered up a handful of themes to help you get started on your care package creation, and a whole host of ideas for goodies that you can include. It’s no surprise that self-care is the flavor of the month right now — and for good reason! It’s all too easy for us to neglect our own necessary care and keeping in the face of life’s stressors, and it’s wonderful to see a cultural shift towards prioritizing health and wellbeing. 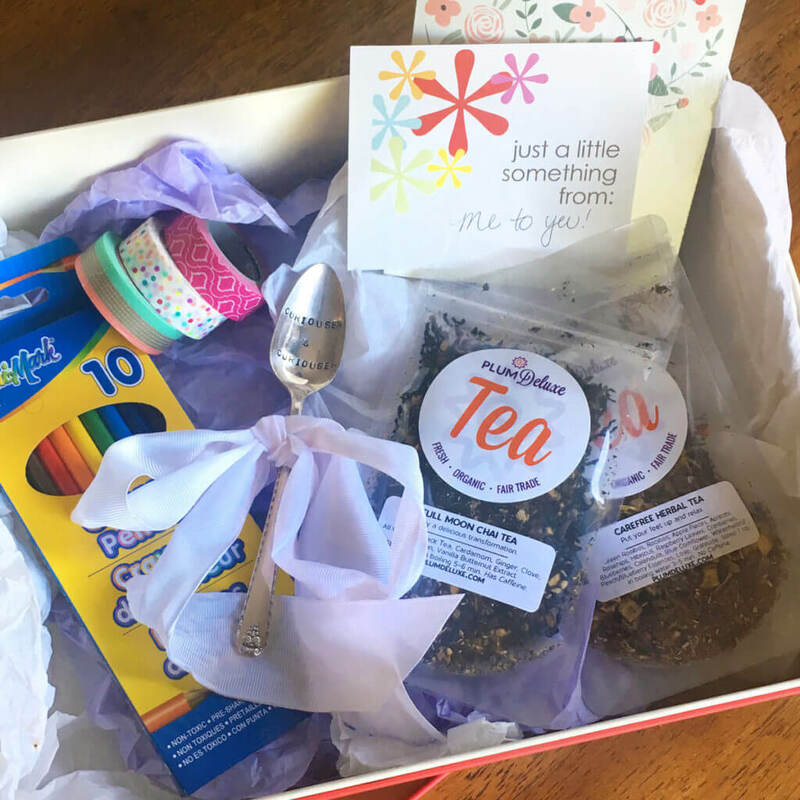 If you’ve got a friend who could use a little self-care boost for themselves, why not assemble your own self-care tea package to make it even easier for them? 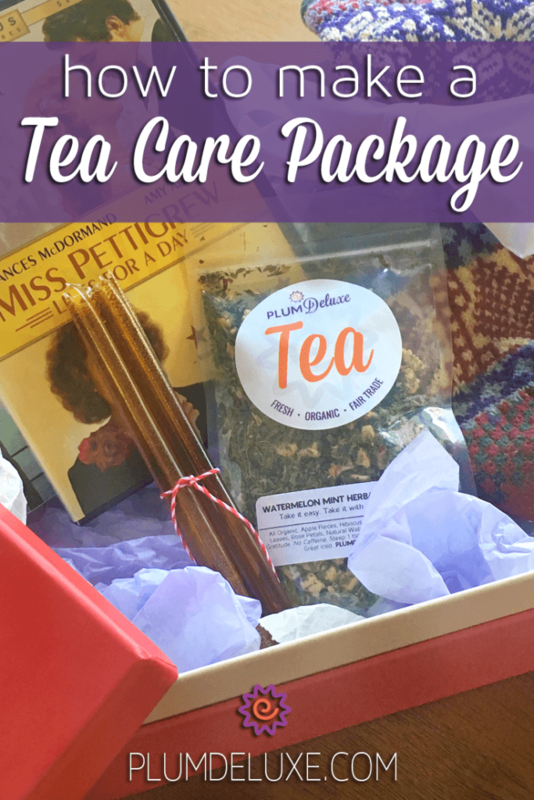 First and foremost, a self-care kit should of course include tea! Something calming and herbal is a great pick, soothing to the nerves while keeping stimulants like caffeine for another time. And while a bath might not necessarily be a sustainable daily solution for long-term self-care, a simple magnesium soak can do wonders to help take the edge off on the hardest days. Whether this a bath bomb from a favorite local shop, some fresh and delightful tea-infused salts, or a small bag of epsom salts from the drugstore, all are perfect to have on hand for when the mood strikes. To round out your self-care package, why not include a small journal with a lovely writing utensil? A journal can offer an opportunity to process complicated thoughts, become a holding space for doodles, big dreams, intentions, and hopes! There’s nothing like a fresh, blank page awaiting the pen to encourage some mindful time for self-care. Perhaps your friend is a more social creature, and looking for an easy way to throw an impromptu gathering for their tea-loving friends (or themselves!). With a little help, a tea care package created all around hosting a DIY tea party can be a great, fun, and unusual place to start. A great tea party starts, of course, with tea. Including a few vastly different flavor profiles — a decadent dessert tea and a bold and fruity herbal, or a hearty breakfast blend and a soothing chamomile, for example — is the best way to ensure that your friend is ready to host any flavor of tea lover. Besides tea itself, every good tea party wouldn’t be complete without some fun tea swag. Something unusual like a pressed spoon makes a lovely gift as well as a great tea party conversation starter. Or maybe you’re hoping to keep things simple for your friend and plan to throw in a box of unbleached tea bags so they can brew individual cups for all of their guests! Both are practical and useful as well as simple and pretty, and make the perfect tea party accessories. And finally, a good tea party must have some sort of entertainment. While there are countless options for any style of tea party, one I’m particularly partial to is the coloring tea party. It’s great way for guests to come together, spend some time on a creative and mindful pursuit, all while encouraging as much — or as little — conversation and quality time as they’d like! The best part? With the recent popularity of coloring books for adults, you can find any theme under the sun to match your friend’s interests, and many inexpensive coloring books and coloring tools (pens, crayons, markers, and paints) can be found everywhere, from the bookstore to the dollar store and beyond. 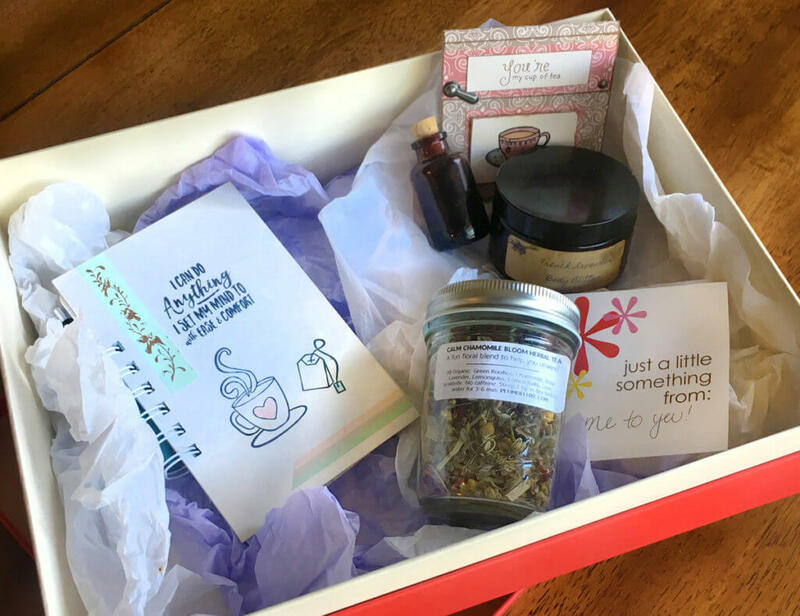 For our final tea care package, why not let your friend know that you’re with them even in the toughest of times — with a sick day kit? Whether your friend saves these goodies for a rainy day or uses them to boost their mental health and wellness right away, it’s always nice to have the lovely and tangible reminder of someone who cares about you when you’re not feeling your best. First things first, the tea. I’m partial to something especially herby when I’m feeling sick, so why not choose something with a hint of sage, or ever-popular turmeric? Honey sticks or drops are a great addition to a sick-day care package as well; besides being delightful in your cuppa, a tiny spoonful of honey or a candy drop can be remarkably soothing on a sore or dry throat. And, of course, in keeping with this theme of sick-day comfort, what could be more comforting than some coziness in the form of a pair of fuzzy socks or a fillable hot water bottle? 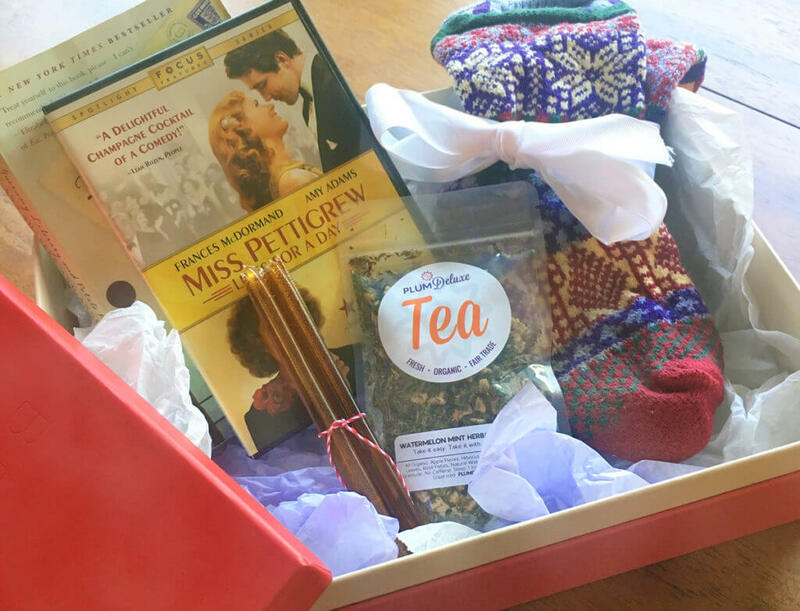 Add in a DVD of your friend’s favorite comfort movie or a cozy, immersive novel (I particularly love ones about tea — of course!) to break up the time spent asleep and recuperating on the couch? These kits are both simple to pull together and truly won’t break the bank. But what your recipients will appreciate above all else is the thought and care put into these gifts on their behalf!